Geomares Education is introducing a new book ‘GNSS Survey & Engineering’, written by Huibert-Jan Lekkerkerk. GNSS Survey & Engineering aims at providing the everyday professional GPS user with enough background for the understanding and correct operation of satellite navigation equipment in general and GPS in particular. Today, GPS is almost synonymous with simple navigation and positioning in nearly all sectors. There are many brands and models to choose from and prices are low. Even so, thorough knowledge of satellite navigation seems to be private to specialists like geodesists and manufacturers. The group of daily users of GPS systems and data however is becoming larger by the day. The book is based on the lectures the author has written for the Skilltrade course in hydrographic surveying as well as a series of articles on satellite navigation systems. The author of the book, Huibert-Jan Lekkerkerk, has bachelor degrees in hydrographic surveying and maritime electronics as well as a masters degree in geographic information management. From 2000 onwards he has been involved as lecturer with Skilltrade and Maritiem Instituut Willem Barentsz. He has written many articles on surveying in general and GNSS in particular for various publications and he has performed reviews and tests of GNSS equipment. The publisher of the book, Geomares Education, Lemmer, The Netherlands, holds several ECDIS and e-navigation products in its portfolio such as The Electronic Chart Fundamentals, Functions, Data and other Essentials A Textbook for ECDIS Use and Training by Hecht et al. (www.electronic-chart.nl) and the training books ECDIS BASICS and Voyage Planning with ECDIS. 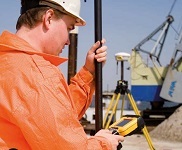 The new book GNSS Survey & Engineering will be available via the online store at http://www.geomares.nl/product/gnss-survey-engineering/ at the price of EUR59 (excl. VAT if applicable). Title: GNSS Survey & Engineering. Handbook for Surveyors and Survey Engineers.